Before settlers reached the coasts of California, the Newport area and surrounding areas were very prominent Indian lands. Indian shells and relics can still be found today scattered throughout the area. Though, throughout the 1800s, settlers began to settle the area due to the availability of land. The State of California sold acre-plots of land for $1 a piece in the Newport area. Anglo-American inhabitation in the area grew substantially following the events of 1870 when a 105-ton steamer named The Vaquero, captained by Captain Samuel S. Dunnells (against warnings posted by surveyors) safely steered through the lower and upper bay of Newport where it unloaded its cargo. James Irvine, after hearing the astonishing news, quickly traveled from his home in San Francisco to the San Joaquin Ranch. Meeting in Irvine's ranch house near current day UC Irvine with his brother, Robert Irvine, and friend James McFadden, they all agreed that the newly found port should be named simply, "Newport" thus where Newport Beach gets its name. Newport Beach extends in elevation from sea level to the 1161 ft (354 m.) summit of Signal Peak in the San Joaquin Hills, but the official elevation is 25 feet (8 m) above sea level at a location of 33°37′0″N 117°53′51″W﻿ / ﻿33.61667°N 117.89750°W (33.616671, −117.897604). Newport Harbor is a semi-artificial harbor that was formed by dredging Newport Bay estuary during the early 1900s. Several artificial islands were built, which are now covered with private homes: Newport Island, Balboa Island, Little Balboa Island, Collins Island, Bay Island, Harbor Island, Lido Isle and Linda Isle. Newport Harbor once supported maritime industries such as boatbuilding, shipbuilding, and commercial fishing, but today it is used mostly for recreation. Its shores are occupied mostly by private homes and private docks. With approximately 9,000 boats, Newport Harbor is one of the largest recreational boat harbors on the U.S. west coast. It's a popular destination for all boating activities, including sailing, fishing, rowing, canoeing, kayaking, and paddleboarding. Commercial maritime operations today include the Catalina Flyer ferry to Catalina Island, harbor tours, sport fishing and whale watching day trips and charters, and a few small commercial fishing boats. Newport Bay is divided by the Pacific Coast Highway bridge, which is too low for most sailboats and very large boats to pass under. North of the bridge is referred to as Upper Newport Bay, or the Back Bay. South of the bridge is commonly called Lower Newport Bay, or Newport Harbor. However the Back Bay also has harbor facilities, especially the marina and launch ramp at The Dunes. The north end of the Newport Harbor channels around Lido Island have a number of small business centers and were at one time used by the fishing fleets as their home. On the North East side of the channel, the Lido Marina Village now provides the local port to many "Newport Party Boats" as well as small merchants and local restaurants. It also hosts the area boat show each year as well as an organic "Farmers Market" Sundays, in addition to being the port for the local Gondola Company. In 2014, the center was closed for a renovation. In 1927 a home was built at the mouth of the entrance of Newport Harbor that came to be known as the China House of China Cove. The home was built using the traditional Chinese architecture. It was a landmark in the Newport Beach Harbor until it was demolished in the 1980s. Some of the original roof can be seen on a home located in the China Cove. Upper Newport Bay is an estuary that was formed by a prehistoric flow of the Santa Ana River. Today it is fed by a small stream from San Diego Creek. Much of Upper Newport Bay is a protected natural area known as the Upper Newport Bay Ecological Reserve, established in 1975. Newport Beach has a mid-latitude semi-arid climate (Köppen climate classification BSk) with Mediterranean (Csb) characteristics. Like many coastal cities in Los Angeles and Orange counties, Newport Beach exhibits weak temperature variation, both diurnally and seasonally, compared to inland cities even a few miles from the ocean. The Pacific Ocean greatly moderates Newport Beach's climate by warming winter temperatures and cooling summer temperatures. Newport Beach does not receive enough precipitation to qualify as a true Mediterranean climate. The highest temperature ever recorded at Newport Beach between 1977 and 1996 was 32.7° C (91° F) on August 12, 1991 and the lowest was -1.7° C (29° F) on January 15, 1996. The population was spread out with 14,744 people (17.3%) under the age of 18, 6,659 people (7.8%) aged 18 to 24, 22,299 people (26.2%) aged 25 to 44, 25,322 people (29.7%) aged 45 to 64, and 16,162 people (19.0%) who were 65 years of age or older. The median age was 44.0 years. For every 100 females, there were 97.1 males. For every 100 females age 18 and over, there were 95.5 males. As of the census of 2000, there were 70,032 people, 33,071 households, and 16,965 families residing in the city. The population density was 4,738.8 inhabitants per square mile (1,829.5/km²). There were 37,288 housing units at an average density of 2,523.1 per square mile (974.1/km²). The racial makeup of the city was 92.22% White, 0.53% African American, 0.26% Native American, 4.00% Asian, 0.12% Pacific Islander, 1.13% from other races, and 1.74% from two or more races. Hispanic or Latino of any race were 4.71% of the population. There were 33,071 households out of which 18.0% had children under the age of 18 living with them, 42.5% were married couples living together, 6.1% had a female householder with no husband present, and 48.7% were non-families. 35.3% of all households were made up of individuals and 10.1% had someone living alone who was 65 years of age or older. The average household size was 2.09 and the average family size was 2.71. In the city, the population was spread out with 15.7% under the age of 18, 6.5% from 18 to 24, 33.0% from 25 to 44, 27.2% from 45 to 64, and 17.6% who were 65 years of age or older. The median age was 42 years. For every 100 females, there were 97.9 males. For every 100 females age 18 and over, there were 96.6 males. According to a 2008 US Census estimate, the median income for a household in the city was $95,511, while the median family income was $126,976. Males had a median income of $73,425 versus $45,409 for females. The per capita income for the city was $63,015. About 2.1% of families and 4.4% of the population were below the poverty line, including 3.0% of those under age 18 and 3.5% of those age 65 or over. The City of Newport Beach was incorporated on September 1, 1906 and adopted its charter on January 7, 1955. The city implements a council-manager form of government, directed by a seven-member council who reside in specific geographic districts, but are elected at-large. Council elections take place in even-numbered years, and councilmembers serve four-year terms. The mayor is chosen annually by the city council. Until 1927, the governing body of the City was known as a Board of Trustees with a President as its head. An act of the Legislature in 1927 changed the Board to City Council with a Mayor as the head. As of January 2016, the California Secretary of State reported that Newport Beach had 53,131 registered voters, and more than half of them (28,887) are Republicans. According to a report by the Sacramento Bee, Newport Beach is the most Republican city in California. In the California State Legislature, Newport Beach is in the 37th Senate District, represented by Republican John Moorlach, and in the 74th Assembly District, represented by Democrat Cottie Petrie-Norris. In the United States House of Representatives, Newport Beach is in California's 48th congressional district, represented by Democrat Harley Rouda. Newport Beach is home to one Fortune 500 company, insurer Pacific Life. Other companies based in Newport Beach include Acacia Research, Galardi Group (Wienerschnitzel, The Original Hamburger Stand, and Tastee-Freez), the Irvine Company, Jazz Semiconductor, PIMCO, and Urban Decay. Fletcher Jones Motor Cars in Newport Beach is the largest Mercedes-Benz dealership in the world. At one time Edwards Theatres had its headquarters in Newport Beach. Before its dissolution Air California was headquartered in Newport Beach. The city's largest law firm is Stradling Yocca Carlson & Rauth, with approximately 75 attorneys at its Fashion Island location. Toyota has a design center, Calty Design Research, in Newport Beach which is responsible for the exterior design of the 2nd, 5th, and 7th generation Celica, as well as some Lexus and Scion models. Beachgoers have flocked to Newport Beach since the Pacific Electric Railway started bringing them in 1905. Attractions include the city beaches from the Santa Ana River to the tip of the Balboa Peninsula, Corona del Mar State Beach, and the beaches at Crystal Cove State Park. Newport Beach is renowned for good surfing, especially between Newport Pier and the Santa Ana River. At the tip of the Balboa Peninsula, The Wedge offers world-class bodyboarding and bodysurfing. Newport Pier and Balboa Pier both draw fishermen and sightseers. A boardwalk (albeit made of concrete rather than actual wooden boards) runs 2.9 miles (4.7 km) from 36th Street in West Newport, past Newport Pier and Balboa Pier, to between E and F Streets on the Balboa Peninsula. Newport Harbor is the largest recreational boat harbor on the U.S. west coast, and a popular destination for all boating activities, including sailing, fishing, rowing, kayaking, and paddleboarding. The annual Christmas Boat Parade dates back to 1908. The New York Times has called it, "One of the top ten holiday happenings in the nation". Competitive sailing, rowing, and paddling events occur almost every weekend, and weekdays during summer. The annual Newport to Ensenada International Yacht Race is the largest sailboat race in the world. Boating activities are organized by five private yacht clubs, along with Orange Coast College, UC Irvine, and the Sea Scouts, all of which have sailing, rowing, and water activity bases on the harbor. The Newport Aquatic Center allows open public participation in competitive rowing, canoeing, kayaking, and outrigger canoe racing. The Orange Coast College School of Sailing and Seamanship offers recreational and professional sailing and mariners' courses and certifications, including United States Coast Guard licensing. Hand-carried boats may be launched from Newport Harbor's public beaches. A launching ramp at The Dunes RV Resort and Marina provides access for trailered boats. Harbor boat tours feature celebrity homes and other waterfront points of interest. Large charter vessels cater to weddings and other special events. Rental and charter boats of all sizes and types are available from several operators. The Newport Harbor Nautical Museum is dedicated to the history of Newport Harbor, and the industries and people that were attracted to the waters of Newport Beach. On the Balboa Peninsula, the historic Balboa Pavilion and Balboa Island Ferry are the city's most famous landmarks. Adjacent to the Pavilion, the 500 passenger Catalina Flyer provides daily transportation to and from Avalon, located on Santa Catalina Island. In the same vicinity, the Balboa Fun Zone offers a ferris wheel, bungee jumping, arcade games, souvenir shops and eateries, boat rentals, and harbor tour boat rides; and is also home to the Newport Harbor Nautical Museum. Balboa Island's village charm draws many visitors. A waterfront path around the island attracts walkers and joggers, and provides easy access from the ferry to the shops and restaurants on Marine Ave.
Upper Newport Bay, or the Back Bay, is ringed by Back Bay Drive and a network of trails and paths that attract bicyclists, rollerbladers, joggers, and walkers. Bird watchers and nature lovers are drawn to the Upper Newport Bay Ecological Reserve and Peter and Mary Muth Interpretive Center; and to Crystal Cove State Park, which features tide pools at the beach, and backcountry hiking and mountain biking trails. Camping is available at Crystal Cove State Park, and at the Newport Dunes RV Park Resort and Marina. Whale watching is also popular, with both scheduled and charter boats leaving from Newport Harbor. Whales and dolphin can often be seen from the pier and shoreline during migration season. Fishing is also extremely popular in Newport Bay, off the coast of Newport, and along the Newport Bay Jetty. In the bay there are multiple locations to purchase bait for dockside or spear fishing convenience. There are about 80 fishable species located in Newport Bay. A few of the most commonly fished species are: Gray Smoothhound Shark, Leopard Shark, Round Stingray, Shovelnose Guitarfish, Pacific Staghorn Sculpin, Silvery Mullet, Top-smelt, California Halibut, Spotted Sand Bass, Yellowfin Croaker, Bat Ray, Thornback Ray, Diamond Turbot, Shiner Surfperch, Corbina, Opaleye, Pile Surfperch, and Red Shiner. Commercial fishing is also prominent in offshore Newport Beach and Newport Bay. One such sea creature commercially fished in the reefs in this area is lobster. Lobster season opens in late September. The boardwalk is a natural draw for bicyclists. Beach cruiser bikes can be rented at several places on the Balboa Peninsula. Bicyclists are also drawn to Back Bay Drive and the bike paths around Upper Newport Bay; the hilly roads winding through Newport Coast and the San Joaquin Hills; and the mountain biking trails in the San Joaquin Hills and Crystal Cove State Park. Pacific Coast Highway provides access to these areas and is a major bicycle route through the region, despite being shared with heavy motor vehicle traffic. Many neighborhoods in Newport Beach are amenable to bicycling. Locals are inclined to use bicycles for short trips, especially to get through summer beach traffic and avoid motor vehicle parking shortages. The Pelican Hill area has two golf courses, both of which reopened in November 2007 after design enhancements were completed, as well as the construction of a new resort and clubhouse. Both courses rank among the Golf Digest America's 100 Greatest Public Golf Courses. Fashion Island at Newport Center is a regional shopping and entertainment destination. Also at Newport Center, the Orange County Museum of Art exhibits modern and contemporary art, with emphasis on the work of Californian artists. The Newport Theater Arts Center presents high quality live theater in a 90-seat venue with low ticket prices. Dining in Newport Beach, like many oceanfront towns, tends to focus on seafood restaurants but there are a variety of restaurants that range in price and type of food. Some of the restaurants in Newport Beach are the 21 Oceanfront, Bayside Restaurant, Sol Grill, Gulfstream, Mastro's, and Fleming's Prime Steak House. Some local favorite food vendors include: The Crab Cooker, Bear Flag Fish Co., and True Food Kitchen. After a night at the bars, many locals know to go to the late night eateries; Laventina's for a quick and delicious pizza or Seaside Bakery for savory croissants and donuts. The village areas of Corona del Mar and Balboa Island are ideal for walking to explore the shops and restaurants. Some other areas of interest include Balboa Village area between the ferry and the pier, and the area encompassing Newport Pier, McFadden Square, Cannery Village and Lido Village. Newport Beach has two farmers' markets: Saturday mornings in Corona Del Mar, at the corner of Marguerite and Pacific Coast Highway; and Sunday mornings in Lido Village, where Via Oporto is closed to traffic. The farmers market at Via Oporto has approximately around 15 vendors. *The Music Video for Childish Gambino’s "3005" was filmed on the Ferris Wheel at the Balboa Fun Zone. The TV show The O.C. was based on the fictional lives of people living in Newport Beach. MTV replaced its hit teen-reality series Laguna Beach: The Real Orange County with a new show, Newport Harbor: The Real Orange County, on August 15, 2007. Only the cast and location changed in the new series, based on the lives of high school students living in Newport Beach. The TV series Arrested Development is set in Orange County and often features scenes at Newport Beach. Several scenes from the Disney Channel movie The Thirteenth Year were filmed at the Balboa Pavilion in 1999. The pop rock band Cute Is What We Aim For has a song titled "Newport Living." The TV series The Real Housewives of Orange County featured scenes of Newport Harbor. One guest on You Bet Your Life in 1954 was mayor of Newport Beach and specifically noted that Balboa was a congregating point for southern Californian young people over Easter break, with 35,000 visiting the town of 18,000. The exterior of the Newport Beach Central Library appeared as the reunion venue in the 1997 film Romy and Michelle's High School Reunion. The Devil Inside video by the Australian band INXS was filmed around the Balboa Fun Zone. The 1917 film Cleopatra by J. Gordon Edwards was filmed in Newport Beach. The clothing brand Hollister Co. has featured many brands including clothing that says Newport Beach. The movie All Quiet on the Western Front (1930) was filmed at Fashion Island in Newport Beach before its construction. The movie The Boatniks (1970) was filmed in Newport Harbor. ^ a b "About the City of Newport Beach". City of Newport Beach, CA. Archived from the original on September 27, 2008. Retrieved July 29, 2008. A concise historical timeline compared to History of Newport Beach. ^ a b c Felton, James P. (1988). "Newport Beach Chronological Timeline". Newport Beach: The First Century, 1888–1988. Newport Beach Historical Society. Archived from the original on August 5, 2009. Retrieved July 29, 2008. From a portion of that work reproduced on the City's Public Library web site. ^ "City Council". City of Newport Beach. Retrieved December 17, 2014. ^ "Newport Beach". Geographic Names Information System. United States Geological Survey. Retrieved November 7, 2014. ^ "Newport Beach (city) QuickFacts". United States Census Bureau. Retrieved February 25, 2015. ^ Felton, James. Newport Beach 75, 1906–1981: A Diamond Jubilee History. ^ "A look at the trains that built the O.C. coast". Los Angeles Times. May 12, 2015. Retrieved January 12, 2016. ^ "Chart 18754". Charts.noaa.gov. Retrieved January 2, 2016. ^ "Newport Harbor Yacht Club – About Us Home". Newport Harbor Yacht Club. Archived from the original on March 9, 2011. Retrieved June 12, 2011. ^ "Newport Dunes Marina Newport Beach". Newportdunesmarina.com. Retrieved January 22, 2011. ^ "Farmer Mark". Newportbeachfm.com. Retrieved January 2, 2016. ^ "Gondola Cruises in Newport Beach, CA". Gondola Romance. Archived from the original on March 13, 2018. Retrieved January 2, 2016. ^ "Lido Marina Village to Undergo Restoration, Reintroduction As Appealing Shopping, Dining, Marina Destination". Visit Newport Beach. Archived from the original on June 30, 2017. Retrieved January 2, 2016. ^ "China House Corona Del Mar". Retrieved April 11, 2011. ^ "Upper Newport Bay Intro". Newportbay.org. Archived from the original on August 31, 2009. Retrieved January 22, 2011. ^ "NOWData - NOAA Online Weather Data". NOAA. Retrieved February 6, 2016. ^ "Climate Newport Beach - Climate data (722973)". ^ "2010 Census Interactive Population Search: CA - Newport Beach city". U.S. Census Bureau. Archived from the original on September 14, 2014. Retrieved July 12, 2014. ^ a b "Newport Beach (city), California". State & County QuickFacts. United State Census Bureau. ^ "Three O.C. cities rank near top in U.S. income – OC Business News". Ocbiz.freedomblogging.com. August 26, 2008. Archived from the original on June 19, 2009. Retrieved January 22, 2011. ^ "Newport Beach Mayors". Archived from the original on July 18, 2014. Retrieved December 7, 2012. ^ "Report of Registration as of January 5, 2016 Registration by Political Subdivision by County" (PDF). ^ Phillip Reese (July 28, 2015). "California's most conservative and liberal cities: Where's yours?". The Sacramento Bee. Archived from the original on April 6, 2016. Retrieved March 24, 2016. ^ Phillips, Anna M. (November 10, 2016). "Newport Beach voters on their reluctant Trump support: 'I plugged my nose and voted for him'". Los Angeles Times. Retrieved July 24, 2018. ^ Lansner, Jonathan (September 25, 2009). "Newport Beach slips in Coldwell ranking of prices". The Orange County Register. p. Business 1. ^ John Gittelsohn (July 13, 2008). "Fletcher Jones tops Ward's Dealer 500 for first time". The Orange County Register. Archived from the original on March 12, 2012. ^ "Contact Us". Edwards Cinemas. May 10, 2000. Archived from the original on May 10, 2000. Retrieved January 2, 2016. ^ World Airline Directory. Flight International. March 20, 1975. p. 465. Retrieved May 24, 2009. ^ Cziborr, Chris (January 31, 2005). "Orange County's largest law firms". Los Angeles Business Journal. Archived from the original on August 20, 2009. ^ "Comprehensive Annual Financial Report For the Fiscal Year Ended June 30, 2012". Archived from the original on April 2, 2015. ^ "Christmas Boat Parade 2010". The Newport Beach Christmas Boat Parade. Retrieved July 26, 2011. ^ "Newport Ocean Sailing Association home to the Newport to Ensenada International Yacht Race, Argosy Races and 14 Mile Bank Race". Nosa.org. April 23, 1948. Archived from the original on July 27, 2011. Retrieved January 22, 2011. ^ a b "Welcome Aboard!". www.occsailing.com. Retrieved January 22, 2011. ^ "UCI Campus Recreation". Campusrec.uci.edu. Retrieved January 22, 2011. ^ "Newport Sea Base | Boy Scouts of America". Ocbsa.org. June 30, 2010. Retrieved January 22, 2011. ^ "Home". Newportaquaticcenter.com. Retrieved January 22, 2011. ^ "Newport Harbor Nautical Museum". Nhnm.org. October 19, 2010. Retrieved January 22, 2011. ^ "Newport Harbor Nautical Museum". Orange County with Anaheim Sights. Fodor's Travel, a division of Random House. Retrieved July 18, 2009. ^ "Pelican Hill". Pelicanhillatnewportcoast.com. May 25, 2010. Retrieved January 22, 2011. ^ "Orange County Museum of Art: About Us". Orange County Museum of Art. Retrieved June 12, 2011. ^ "Orange County Museum of Art (OCMA) – Newport Beach CA – Organization Directory – Organization Detail". Arts Orange County. Archived from the original on July 16, 2011. Retrieved June 12, 2011. ^ "NTAC Home Page". Ntaconline.com. Retrieved January 22, 2011. ^ "Newport Beach Dining". Retrieved December 7, 2012. ^ "Yelp". Retrieved December 7, 2012. ^ "The Thirteenth Year Filming Locations". IMDB. ^ "Cleopatra (1917)". IMDb.com. Retrieved January 2, 2016. ^ "All Quiet on the Western Front Filming Locations". IMDB. ^ a b c "Newport Beach Sister City". Newport Beach Sister City. Retrieved January 22, 2011. Guide to the Collection on the Development of Newport Beach, California. Special Collections and Archives, The UC Irvine Libraries, Irvine, California. Guide to the Lars Labagnino Collection on Newport Beach Real Estate. Special Collections and Archives, The UC Irvine Libraries, Irvine, California. Guide to the Hugh R. McMillan Photographs. Special Collections and Archives, The UC Irvine Libraries, Irvine, California. Balboa Island is an harborside community located in Newport Beach, California, accessible to the public via bridge, ferry and several public docks. The community is surrounded by a paved concrete boardwalk open to pedestrian traffic, designated as a public walking trail by the city.Balboa Island's Marine Avenue is home to local small businesses including restaurants, bakeries and local crafts. The island also has a fire station and a post office. The Balboa Peninsula (also referred to as "Balboa" or "the Peninsula") is a neighborhood of the city of Newport Beach, Orange County, California. It is named after the Spanish explorer, Vasco Núñez de Balboa. Balboa is primarily residential but has some commercial areas as well. California's 74th State Assembly district is one of 80 California State Assembly districts. It is currently represented by Democrat Cottie Petrie-Norris of Laguna Beach. Carsten Thomas Ball (born 20 June 1987) is a retired Australian professional tennis player. Although born and based in the United States, Carsten has represented Australia on tour. Corona del Mar or CdM (Spanish for "Crown of the Sea") is an affluent seaside neighborhood in the city of Newport Beach, California. It generally consists of all land on the seaward face of the San Joaquin Hills south of Avocado Avenue to the city limits, as well as the development of Irvine Terrace, just north of Avocado. Corona del Mar is known for its beaches, tidepools, cliffside views and village shops. Beaches in the area include Corona del Mar State Beach as well as Crystal Cove State Park south of Corona del Mar, accessible by paths winding down a steep hillside. David Denman (born July 25, 1973) is an American actor. He made his film debut in The Replacements. His other feature credits include Big Fish, Fair Game, The Nines, Shutter, Smart People, Fanboys, Let Go, Out Cold, After Earth, Jobs, Beneath the Harvest Sky, Men, Women & Children, The Gift, 13 Hours, Power Rangers, Logan Lucky and Puzzle. On television, Denman starred as "Mike" on the critically acclaimed, but short-lived FOX comedy Traffic Light and in Robert Kirkman’s short lived demonic series Outcast. He has recurred as "Ed Brooks" on Parenthood, as "Tony" on Drop Dead Diva and as Skip the Demon on Angel. He has appeared on numerous TV shows including ER, The X-Files, Mad Men and True Detective. He earned a SAG Award for the role of Roy Anderson, the ex-fiancé of Pam Beesly on the US version of The Office. Devin Bowen (born May 18, 1972) is an American former ATP World Tour professional tennis player. A doubles specialist, he reached a career high doubles ranking of World No. 39, in 2003. Fashion Island is a mall in Newport Beach, California. It is served by Orange County Transportation Authority bus routes 1, 55, 57, and 79. Fashion Island is owned by The Irvine Company. Ford Aerospace was the aerospace and defense division of Ford Motor Company. It was based in Newport Beach, Orange County, California, and was active from 1956 through 1990, when it was sold to the Loral Corporation. Greg Dalby (born November 3, 1985 in Newport Beach, California) is a former American soccer player who is now an assistant coach at Davidson College. The Hoag Classic (formerly Toshiba Classic) is a golf tournament on the PGA Tour Champions. The Hoag Classic is played annually in March in Newport Beach, California at the Newport Beach Country Club. The tournament was founded in 1995 as the Toshiba Senior Classic. Hoag became the title sponsor of the tournament starting in 2019.The longest sudden-death playoff in the history of the PGA Tour Champions occurred at the 1997 event when Bob Murphy defeated Jay Sigel on the ninth hole. The record was broken the following year at the Royal Caribbean Classic. Mossimo is a mid-range American clothing company, founded in 1986 by designer Mossimo Giannulli, and currently owned by Iconix Brand Group. Mossimo specializes in youth and teenage clothing such as shirts, jeans, jackets, socks, underwear, and accessories. The Newport Beach Film Festival (NBFF) is an annual film festival in Newport Beach, California, typically held in late April. Newport Coast is an affluent community south of the main body of the city of Newport Beach, California. 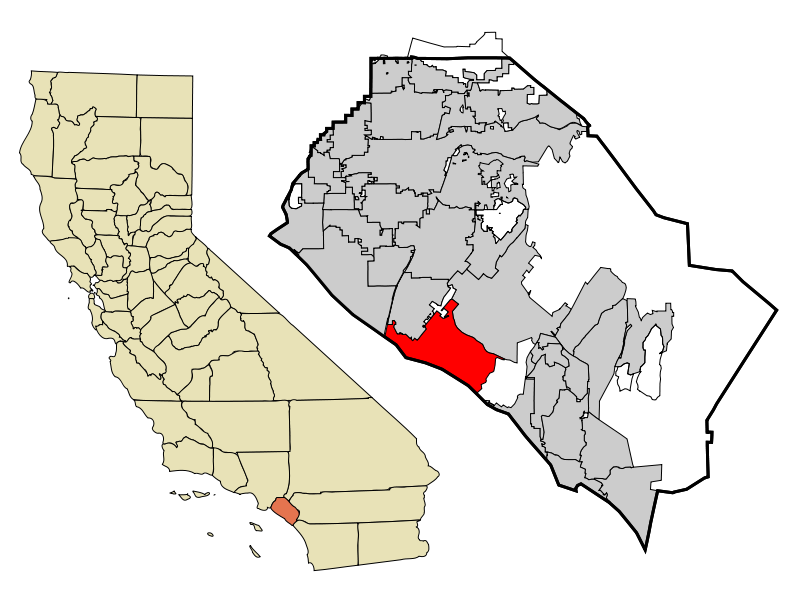 It was a separate census-designated place in Orange County, California, United States, until 2001, when it was annexed into Newport Beach. Newport Beach, California's estimated population is 86,160 according to the most recent United States census estimates. Newport Beach, California is the 96th largest city in California based on official 2017 estimates from the US Census Bureau. The master-planned community was developed by the Irvine Company. There are a variety of home types in the community, from small studio apartments to ocean view mansions occupied by well-known celebrities. The Orange County Breakers are a World TeamTennis (WTT) franchise founded in 2003, owned by Laguna Beach businessman Eric Davidson. The Breakers won the WTT Championship in 2004 and 2017. In 2014, the franchise moved to Greater Austin, Texas, where it was known as the Austin Aces. On December 14, 2015, the Aces announced that the team would move back to Orange County, California for the 2016 season and be renamed the Orange County Breakers. In 2016, the Breakers played their home matches at Breakers Stadium at the Newport Beach Tennis Club. In 2017, the Breakers returned to playing at the Palisades Tennis Club, the venue where they played from 2003 to 2006. Pacific Investment Management Company, LLC (commonly called PIMCO) is an American investment management firm focusing on fixed income. It is headquartered in Newport Beach, California, with 2,300 employees working in 14 offices across 11 countries, and $1.66 trillion in assets under management as of December 31, 2018. The company provides mutual funds and other portfolio management and asset allocation services for millions of investors worldwide. PIMCO offers several different investment products, including core bonds and credit, structured credit, alternatives, real assets, private credit, and currencies. PIMCO oversees investments on behalf of millions of clients, including retirement savers, public and private pension plans, educational institutions, central banks, government agencies, sovereign wealth funds, foundations, endowments, and financial intermediaries. The Palisades Tennis Club is a tennis club located in Newport Beach, California with an entrance at 1171 Jamboree Road.The club, originally called the John Wayne Tennis Club, opened in 1974. It has 16 tennis courts. There are also lounges and massage facilities. The club offers instruction to both youth and adult players.The United States played the Netherlands at the club in the 1997 Davis Cup World Group Quarterfinals.On January 31, 2017, the Orange County Breakers of World TeamTennis announced that the team would move its home matches to the Palisades Tennis Club starting with the 2017 season. Breakers general manager Allen Hardison said, "We are very excited to once again team up with Palisades and bring the Breakers back to their first-ever home." The Breakers played their home matches at the Palisades Tennis Club from their inaugural season in 2003 through 2006. Club owner Ken Stuart said, "Our club has a great history with the Breakers and is no stranger to hosting large-scale professional tennis events. Palisades will offer Breakers fans one of the best settings to watch a Mylan WTT match, and we are certainly looking forward to having our club members and the Orange County tennis community here this summer." Tastee-Freez is a soft serve franchised chain of 23 fast-food restaurants. Its corporate headquarters is in Newport Beach, California, and it has stores in 12 of the United States, with most of its freestanding stores located in Virginia, Illinois and Maryland. The first Tastee-Freez was established in Keithsburg, Illinois.